Cozy Chicks: Kelly Flynn Knitting Mysteries on Audio At Last! Kelly Flynn Knitting Mysteries on Audio At Last! I am really excited! The downloadable audio of the very first book in the Kelly Flynn Knitting Mysteries will be out soon! KNIT ONE, KILL TWO will be available August 2nd from Audible.com. Yay!! Readers have been asking me for YEARS----yes, years----when the Kelly Flynn books would be released on tape or audio. My answer was always the same: Whenever the publisher decides to release them. 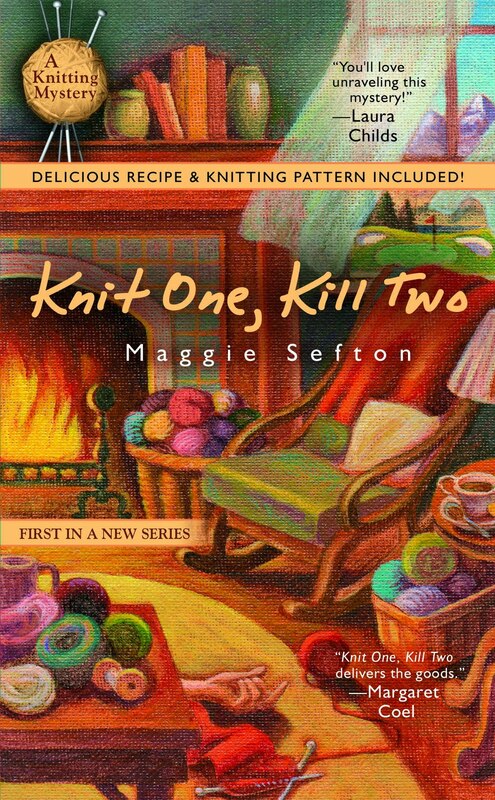 This Spring, my editor gave me the happy news that KNIT ONE, KILL TWO would be released this summer. August 2nd is the day. I just checked the website---again, http://www.audible.com/, and KNIT ONE, KILL TWO wasn't listed yet. Obviously, they don't put anything out until it's available. Audible.com, incidentally, is part of Amazon. I'll check to see if it's available on Barnes&Noble.com too and let you all know. It was fascinating to be involved in the process of transforming KNIT ONE, KILL TWO from the page to audio. Publisher Penguin's Berkley Prime Crime, had three actresses audition for the role as narrator and actress for the book. And---they asked me to check on a website whe re I could listen to all three actresses read the same passage and vote for the one I preferred. That was tres cool, believe me. It was kind of surreal to hear the words you've written for your characters to say come out of someone else's mouth. :) I'm used to hearing myself read the words---but not someone else. Fascinating. That's really cool. I love getting audio b/c I drive all day for work to see clients and it keeps me company. Cool indeed. And just think, you can listen and knit at the same time! Congratulations. Audio books are a wonderful thing for so many reasons. Congratulations! I love listening to books on long car trips (it is so much better than looking for a clear radio station every 20 minutes)! Congrats this will make lots of people happy audio books are nice for vacations or long commutes to work. Finally! This is wonderful news! Tonya--I love listening to tapes while driving Now it can be loaded to MP3 players and iPods. Sheila---A lot of the people asking me have been knitters---and for that very reason. Andrea---you got that right. Static drives me crazy while driving. Babs---I know, and you can't imagine how many knitters love to knit while they listen to books. Deb, Dru, & Annette---Thanks, guys. Krista---That's true about CDs. But the old cassette tapes and the audio have reverse & play options. This is so exciting, Maggie. Big congrats! YAY!!! Congratulations. I love audiobooks, it's how I can maintain my sanity on my commutes for work or cross-country roadtrips. Thanks, Ellery. I'm pretty psyched. All right, Vickie! I hope you enjoy it, and let me know how you like "hearing" the actress read Kelly & friends. Congrats!!! I LOVE listening to Audio books when I drive or just sitting at home cross stitching.